Today I’m excited to introduce to you a project I’ve become a part of this year and look forward to sharing goodies and new ideas for a healthier life style with you all. It’s called The Clean Plate Club from Stonyfield. In a nutshell, we’re a group of bloggers that develop recipes using Stonyfield products in collaboration with other products in the market, such as Divine Chocolate USA, the partner in crime of this blog post. When I received the chocolates and yogurt, I promised myself I’d make something extremely healthy. I didn’t want tempting brownies, muffins, or flour-less chocolate tortes laying around the house, waiting for me to attack. But of course, I still wanted to make something decadent, rich, and at the same time, good for my health and my waistline. and adding good for you fats such as coconut oil. You might be wondering – why is fair trade chocolate better? Simplest way to explain it is that the cacao farmers under the fair trade label are getting paid FAIR prices for their cacao harvest. Getting paid fairly allows cacao-farming families to afford education for their children, new equipment for the farms, and more. It’s the RIGHT thing to do and if you choose to do ONE thing this year, I recommend switching your chocolate consumption to a fair trade chocolate bar. You can read more about the farmers of Divine Chocolate USA on their website under “Meet the Farmers”. Another thing I wanted to showcase was the fact that Stonyfield products are organic. It’s one of the buzzwords of the season and one you should take into consideration when purchasing food for your family, specially in dairy products. What does organic mean in yogurt? It means that the cows that produce the milk to create the yogurt aren’t pumped with antibiotics or hormones. Also, organic cow farmers are firm believers of treating their animals humanely. Heck, I don’t want that bad karma that comes from buying products from a farmer that’s mean to his/her animals, and you shouldn’t either! I’ve read through Stonyfield’s Why Organic section and feel proud to be part of the Clean Plate Club! 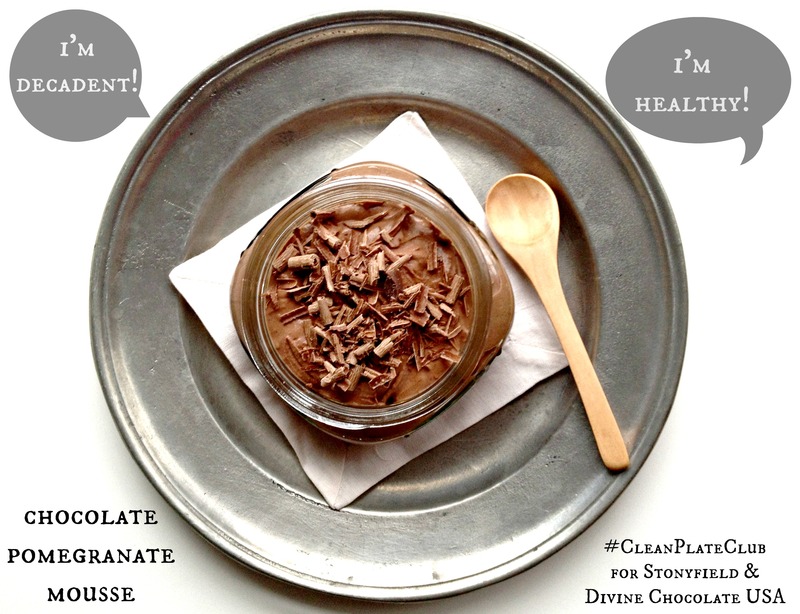 Meet the other bloggers in The Clean Plate Club, as well as check out our Pinterest Board for inspiration. Enter Divine Chocolate USA’s monthly drawing for a basket filled to the brim with fair trade chocolates! A healthier version of the classic chocolate mousse with a touch of tart pomegranate will make this your go to dessert when you need a quick chocolate fix! In a double boiler (small saucepan halfway filled with simmering hot water with a small bowl placed on top), stir together the milk chocolate and coconut oil until melted. Set aside to cool. Whisk together greek yogurt, vanilla bean powder, pomegranate molasses, and cocoa powder until incorporated. Drizzle in melted chocolate and quickly whisk together. 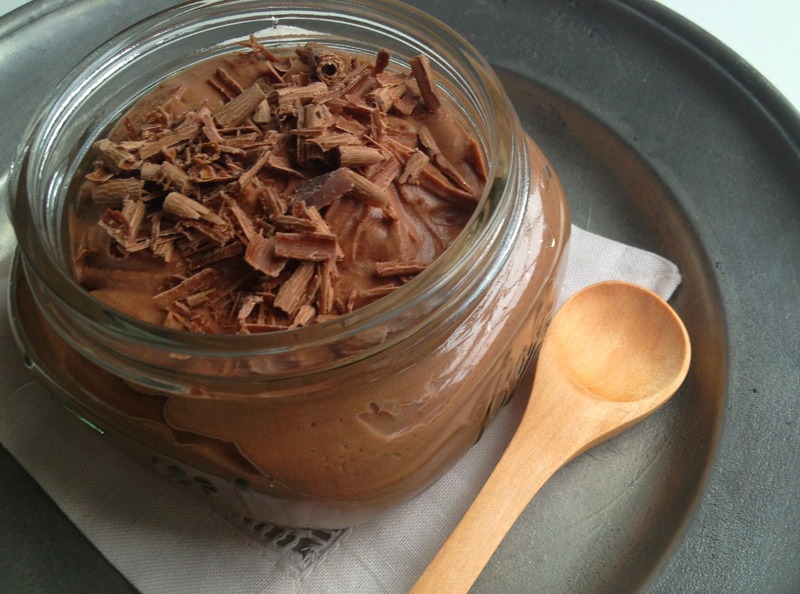 Serve in glass jars topped with shaved chocolate. Disclosure: As part of The Clean Plate Club, I received products free of charge to facilitate this post. This mousse looks incredible! Using yogurt as a base in a brilliant healthy option! Great recipe! Love the recipe and the photos really set of the entire article. We’re big fans of Greek yoghurt in our household so this is will be made very soon. Wonderful! Big PLUS for choosing FairTrade chocolate too. I have the biggest sweet tooth ever – this is a perfect dessert, definitely trying it!! This looks and sounds great! I love the fact that it uses Greek yogurt. Definitely a must-try. Thanks for sharing Marnely. This looks delicious! I’m going to have to buy an extra chocolate bar just to make it. This is something I will definitely try. BTW love all the changes made to the site. It looks so crisp and clean. Love it!